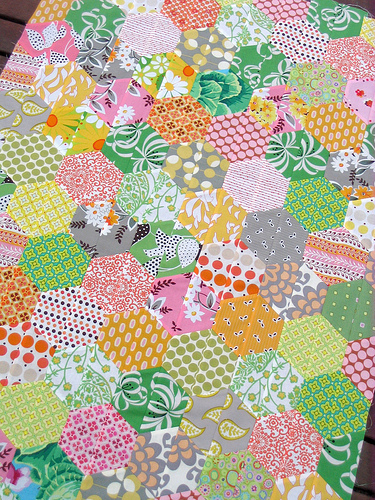 I had a marathon cutting session yesterday, and have now started piecing together my Half Hexagon Quilt. I am about half way through piecing it together. The actual piecing is going well but I am really unsure about this quilt. I go from loving it one minute, to doubting whether these fabrics and colors are going to work. I like the look of the quilt in the pictures more so than when I see it lying on my design floor. (My eyes are starting to hurt from squinting at it!). This is giving me some hope that the overall quilt will turn out ok. What do you think? I'm LOVING it! What a great way to put together hexagons. I like this method. Is there a pattern or ruler or template for this? I'd love to know if you have a minute. Thanks! i'm really liking it! i think the colors and fabrics go really well together. it looks a bit busy since there are so many different fabrics, but i don't think that is a bad thing at all. i suspect that once the quilting is done it will come together quite nicely. I love your quilt. It's so fresh and vibrant. Hang in there ... I think it's going to be great. no it is totally beautiful!!! i love the colours, and the hexagons are so pretty! i could definately take it off your hands for you if you decide you dont love it after all!!! Lookin' good so far in my eyes. I love the color combination. It's not one I'd think to put together, but I think it looks really cool! I really like it. Go to a hardware store and buy a "peep hole" like you put in doors. It is under $5 and you can look through that instead of squinting to get color placement, etc. It works really well! Hope it helps!! have no doubts that this quilt is amazing. I am so amazed at how fast you can get a quilt top together. It's got a very retro/vintage look, with the colors. It definitely works! I LOVE IT!!!!! I want to do one from seeing yours!!! The colors are FANTASTIC!!! You are amazing!! I'm always impressed with your work, and this is no exception. The colors are working great! i LOVE it! your quilts are always so colorful. Oh yes Rita, it's working...absolutely stunning. The grey, green and orange is a gorgeous palette. How will you quilt it? You NEVER disappoint Rita...the colours work beautifully. At first glance it caught my attention. I love the colours, and think the pattern works really well. You're probably second guessing yourself because you've been staring at it endlessly. I do the same thing when I'm working on a project - sometimes you need to step away, work on something else, and go back to it in a few days. nest... katie jump rope... and amy butler... you got me sold!! ... i can't believe how much you got done sooo fast... i just picked my fabrics for this project! I honestly like it alot. The colors are very bright and fresh. A bit like a flower bed in the summer time. Hang in there, I think the end result is going to be great. when i saw the thumbnail on flickr I thought 'wow' and it didn't disappoint when i saw the picture at full size. It definitely has that retro feel, the colours remind me of being small. Which is no bad thing at all. You can get a reducing glass to look at it thru' - saves squinting! I was hesitating between a diamond and an hexagon quilt. Seriously Rita you have been working so hard on this quilt and looking at it so much, no wonder you're getting a little jittery. I think your quilt is outstanding and I wouldn't change a thing! 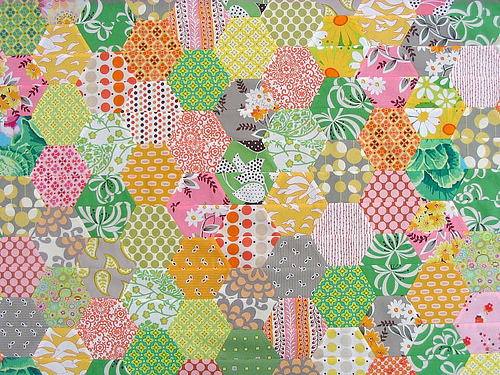 I love it, the patterns go really well together considering they are all so different and the bright colours are very playful. It's better than just OK! LOVE the fabrics. I think you really don't need to doubt yourself, it is gorgeous!! I love your colors! I loved 'em in a stack, I love 'em in the quilt! Keep going!! It is a lot more pink that I expected it to be from your fabric pull. It reminds me of the section in the quilt store with the 30s repros, even though it doesn't look like you have much in there. It's beautiful! It reminds me of a big bouquet of flowers. Great job piecing together those hexagons. Looks like a fun technique. Put my comment in the "I LOVE IT" column! I really like it. I think you are inspiring me to make one of these. I really like the look of yours... I think it looks so vintage chic (I don't know if that is really a word :) I love the fabrics you picked. Lookin' good. And I'm betting when it's quilted, you'll love it even more! I do not remember how I found your blog but am so glad I did. Your quilts are amazing; the colors and pattern designs you use stand out so well. I have gleaned much from the quilts you have displayed. Here's a little more reinforcement - it's a perfect choice of fabrics! Love it a lot. it's so so so good!!!! !